You should always play at a good pace. The committee may establish pace of play guidelines that all players should follow. It's a group’s responsibility to keep up with the group in front. If they lose a clear hole and delay the group behind, they should invite the group behind to play through, irrespective of the number of players in that group. Where a group has not lost a clear hole, but it is apparent that the group behind can play faster, they should also invite the faster moving group to overtake them. You should be ready to play as soon as it's your turn to play. 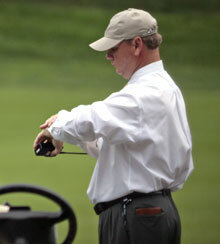 If you need to make up time, play "ready golf", i.e. order of play should be altered to allow shorter hitters to play, rather than wait for a longer hitter to take "the honour". When on or near the putting green, leave your bags or carts just off the green on the way to the next tee. When the play of a hole has been completed, leave the putting green quickly. Mark your card when you reach the next tee. If it is your "honour", mark the card after taking your shot. If you think your ball may be lost outside a water hazard or is out of bounds, to save time, play a provisional ball. Players searching for a ball should signal the players in the group behind them to play through as soon as it becomes apparent that the ball will not easily be found. They should NOT search for five minutes before doing so. Having allowed the group behind to play through, they should NOT continue play until the group coming through has passed and is out of range. When you've played your shot, get back into the cart with your club. Place the club into your bag when the cart next stops.